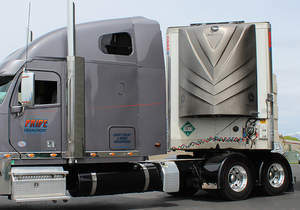 OREM, UT--(Marketwired - Apr 22, 2014) - The air we breathe was kept a little cleaner recently when a Cryometrix CB-40 transport refrigeration unit (TRU) or "Reefer" made history by delivering its first commercial load of frozen foods using a new pollution free refrigeration technology. Frozen ravioli, lasagna, corn dogs and for desert ice cream and popsicles -- all loading into a 53-foot trailer at 10:30 at night in Salt Lake City. Exactly 525 miles, 7 stops and 24 hours later the trailer, now empty, sits quietly in Denver still maintaining the temperature at -15 F. Just another frozen food delivery -- except that it wasn't! No diesel fuel was used to refrigerate the cargo. Several people along the delivery route echoed, "Is this the future?" Reflect Scientific thinks so. The Cryometrix CB-40 TRU is a pollution free refrigeration alternative to diesel-powered systems for transport trailers. The CB-40 uses a patented liquid nitrogen cooling system to achieve consistent temperature control with almost no moving parts and greater reliability. A closed, self-contained refrigeration system ensures nothing but fresh cold air enters the trailer or touches the food. "This was a tough test for the system. Keeping products frozen at -15 F is challenging. The outside air temperature is varying and there are multiple stops where cargo is unloaded," commented Bill Moon, Vice President of Engineering, "We certainly learned things along the way and we got the cargo there safely." Reflect Scientific, Inc. (OTCQB: RSCF), based in Orem, Utah, develops and markets innovative, proprietary technologies in cryogenic cooling for the biotechnology, pharmaceutical, medical, and transportation markets. Among Reflect Scientific's products are low temperature freezers and refrigerated systems for laboratory, transportation and computer server room uses. For more information, visit www.reflectscientific.com.